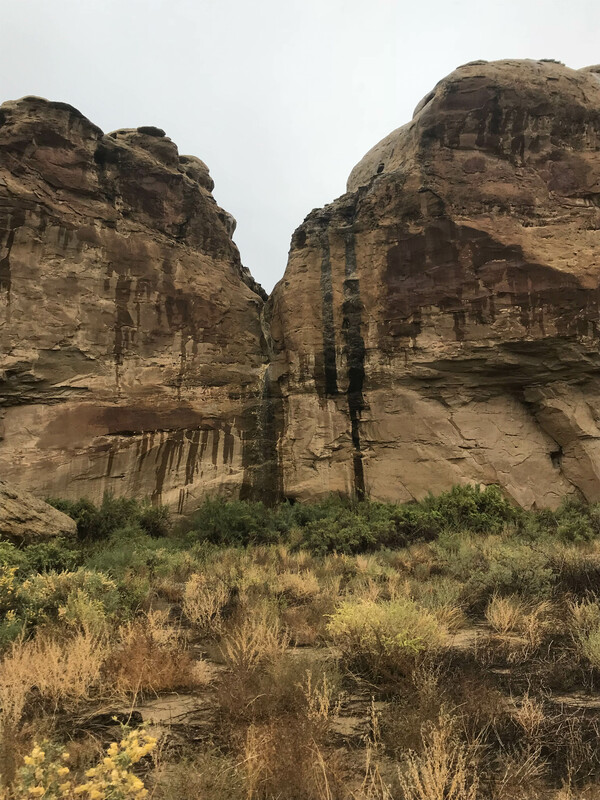 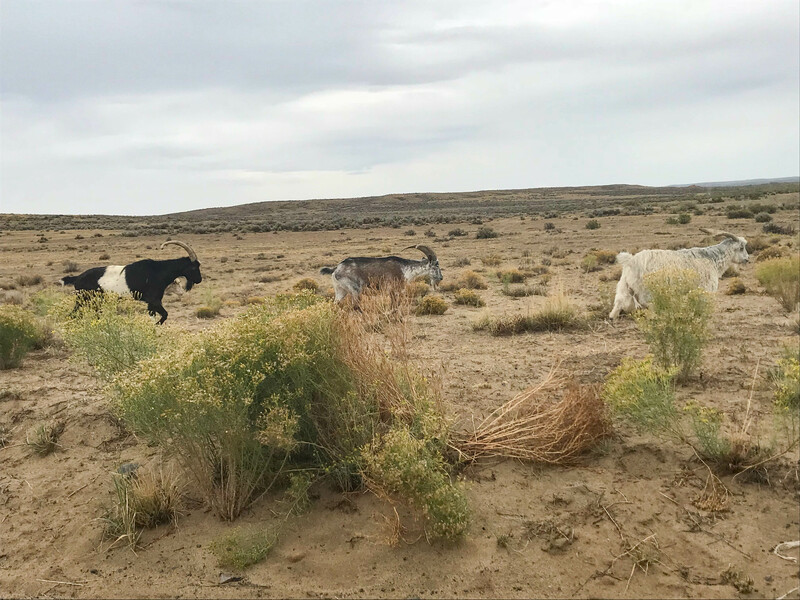 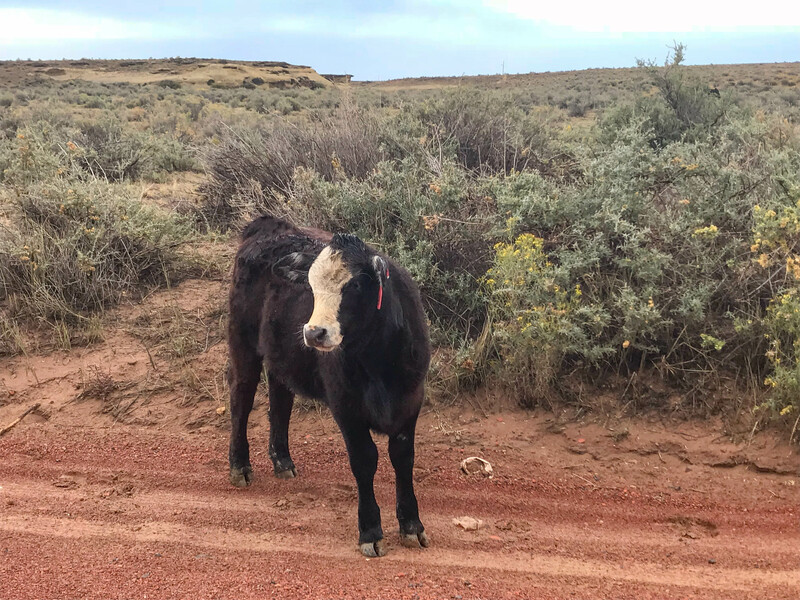 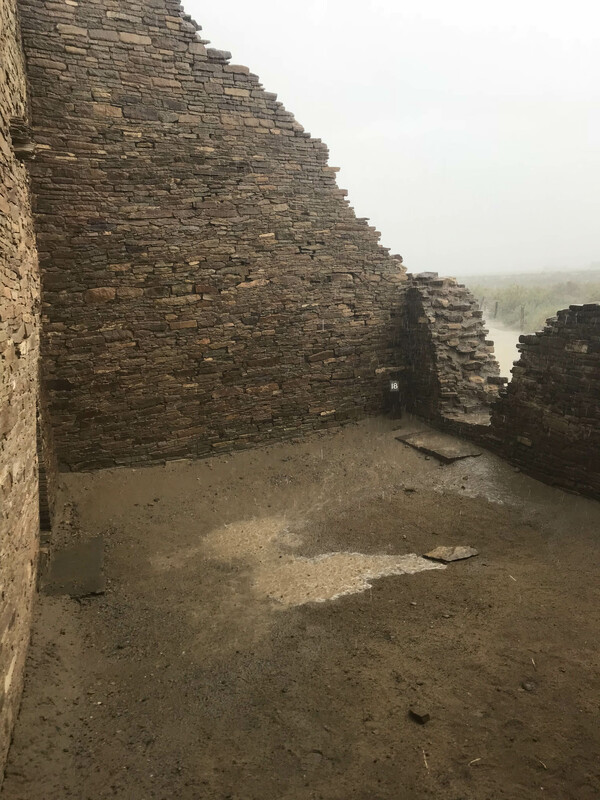 An unpaved and rough road led us into Chaco Culture National Historical Park through gorgeous desert scenery in early October 2018. 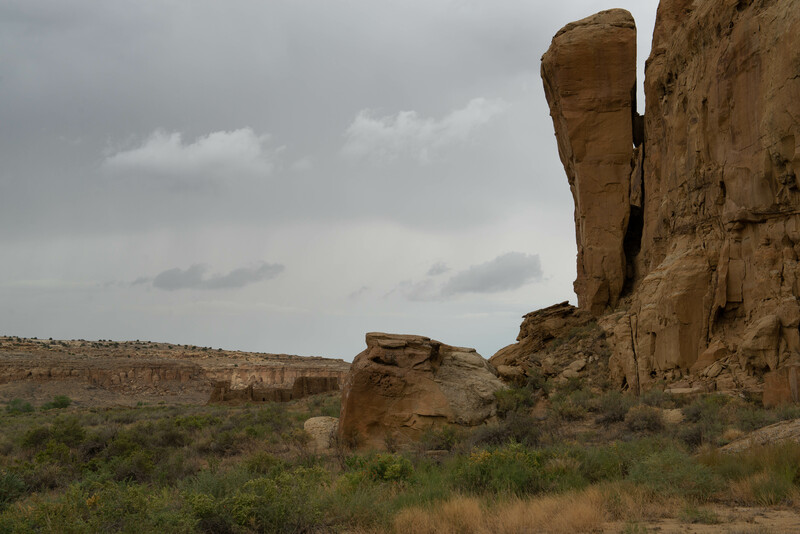 The Jeep has high clearance, trail tires and 4-wheel drive when we need it; and it is great to have in remote and isolated places like these. 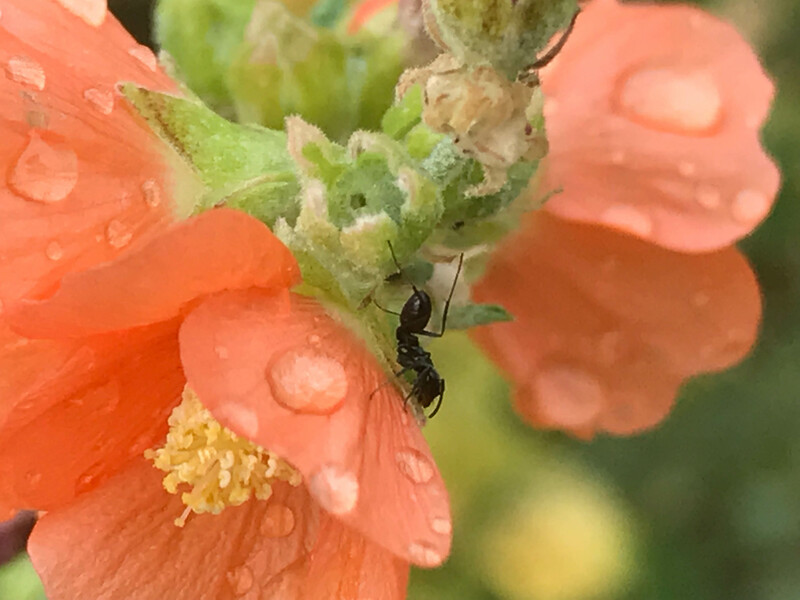 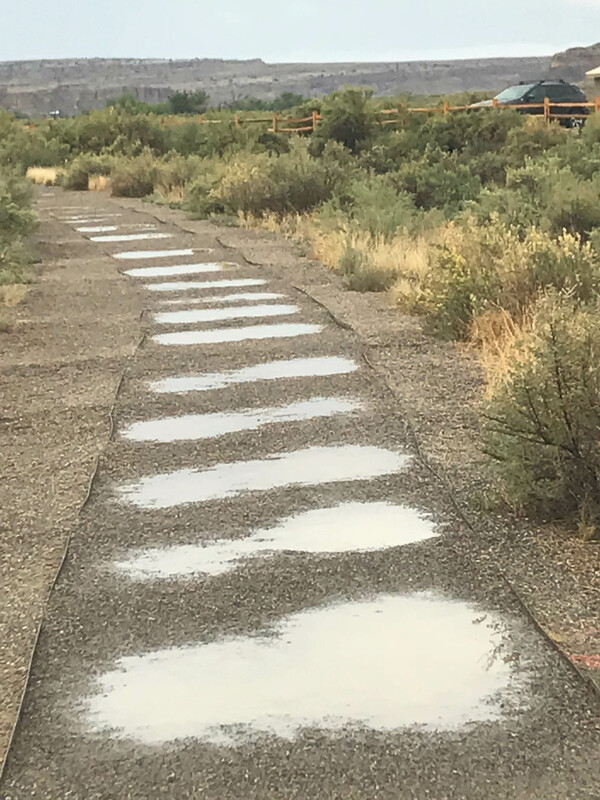 A thunderstorm let loose and darkened the skies enough that the nearby coyotes were calling back and forth to each other, just like they do at dusk. 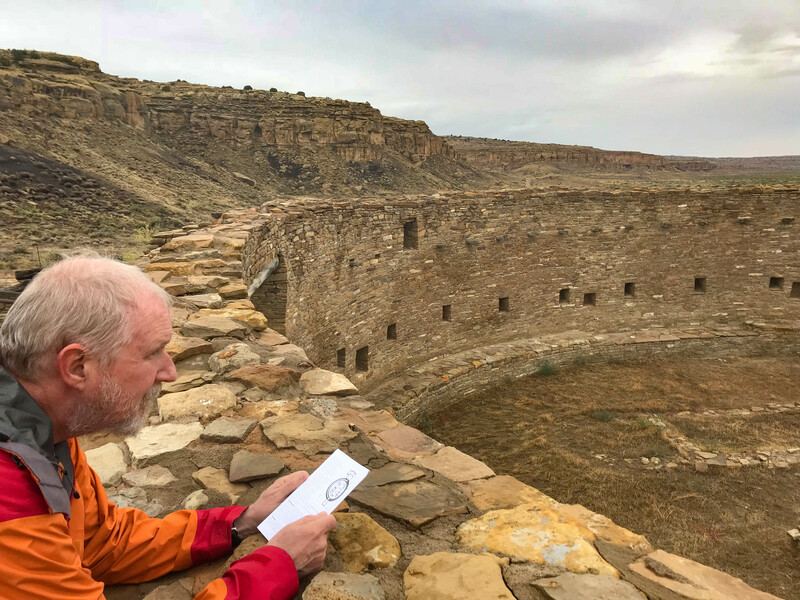 An eeie but cool way to launch this cultural adventure. 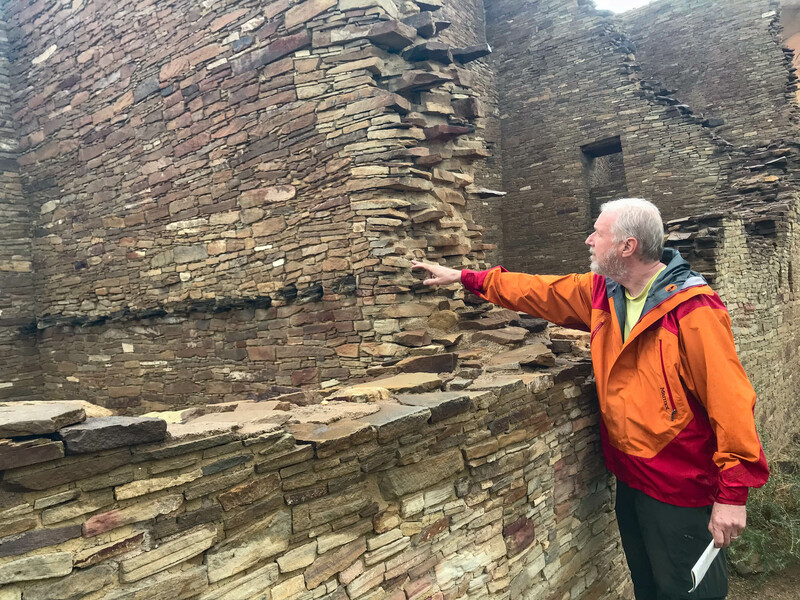 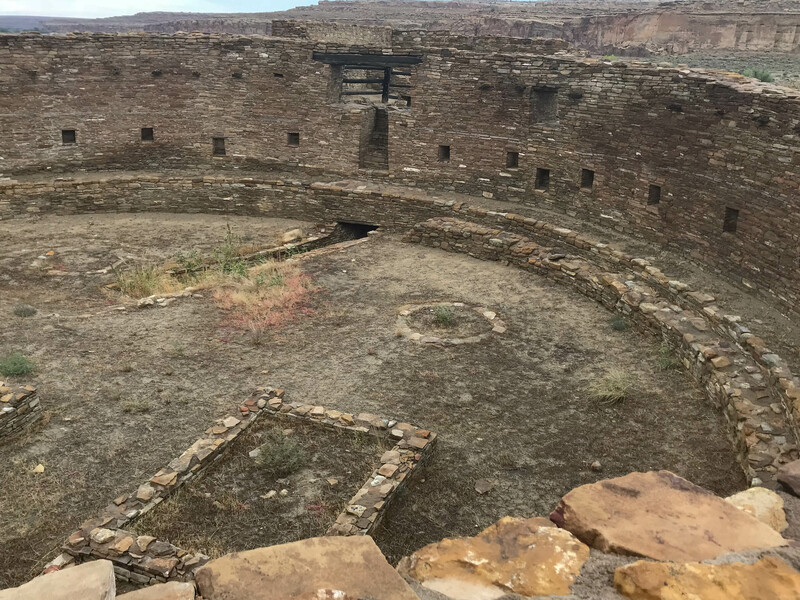 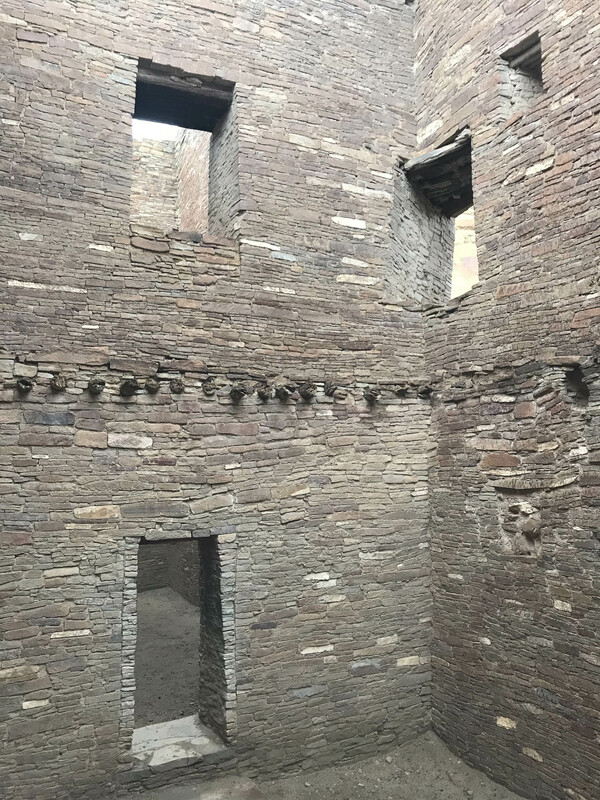 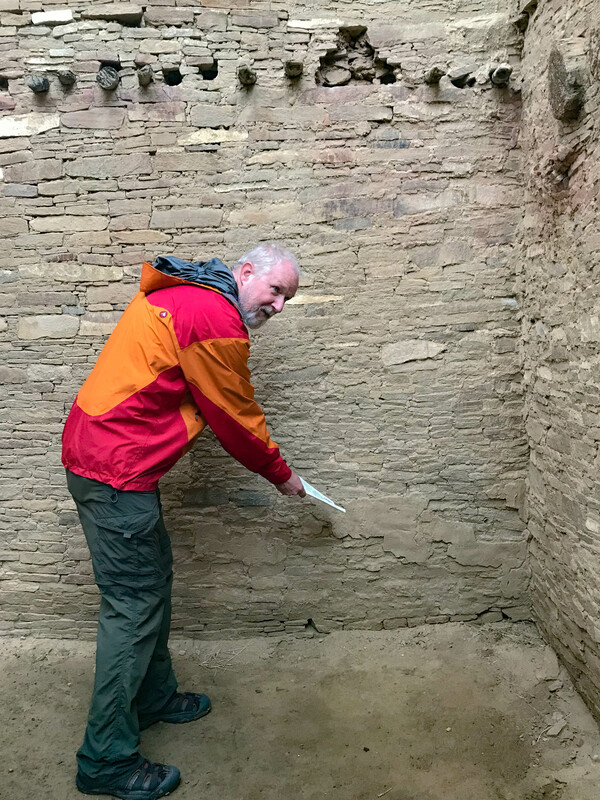 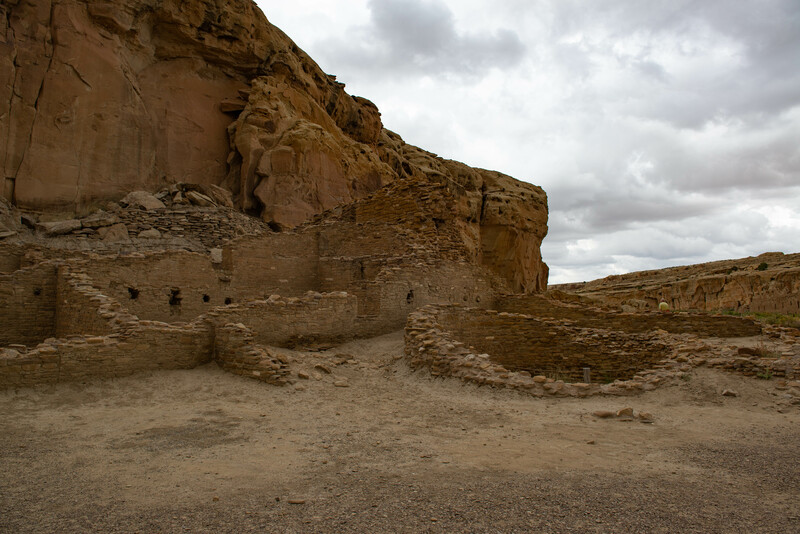 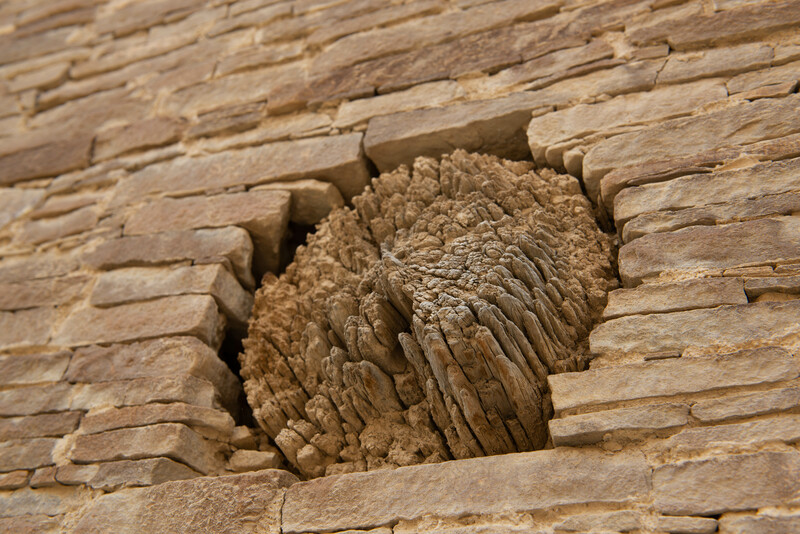 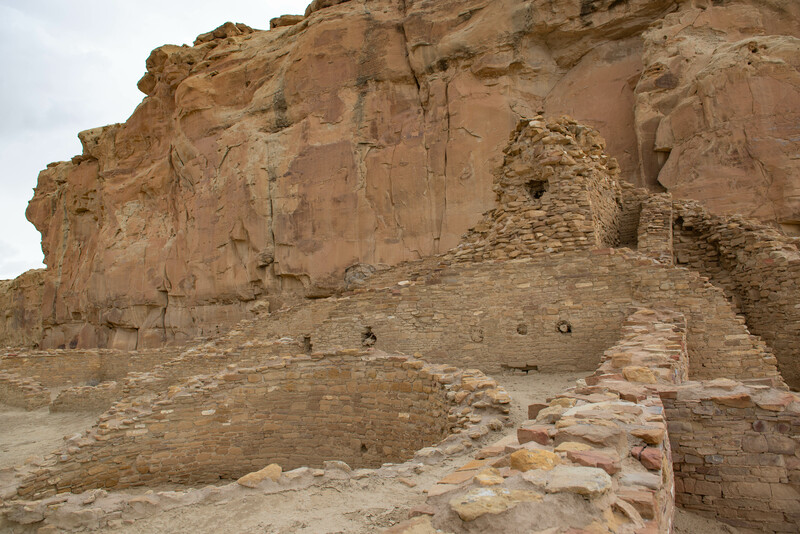 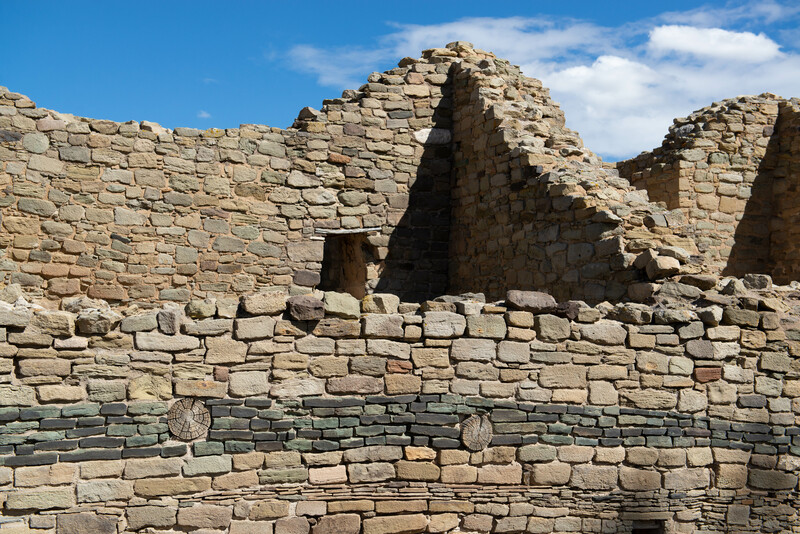 Chaco Canyon was home to thousands of Pueblo peoples between 850 and 1250 A.D. and the ruins highlight their engineering and organizational abilities not seen anywhere else in the American Southwest. 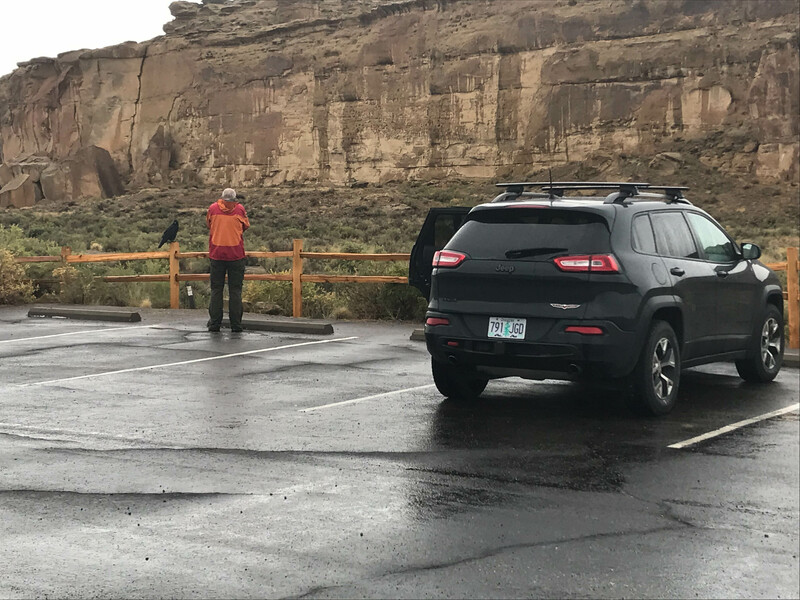 Feeling brave, we didn’t accessorize for a monsoon rain and wind. 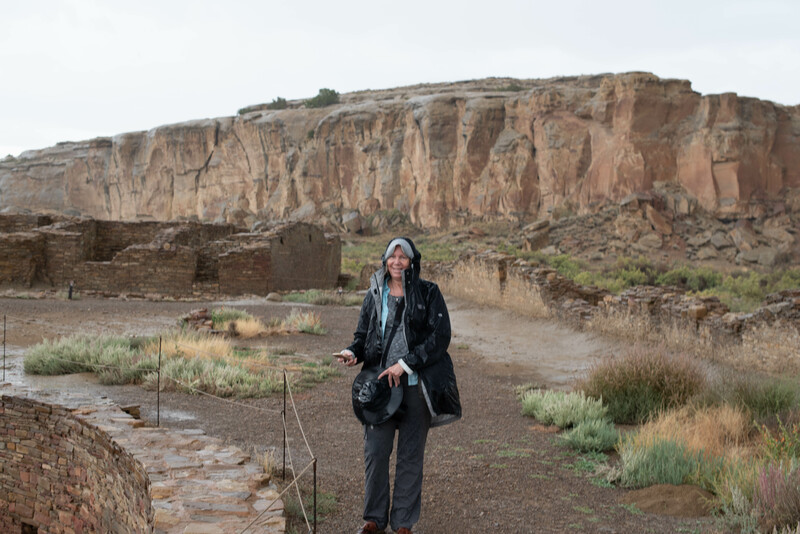 I used my hat to shield the camera and we were completely drenched when we returned to the car. 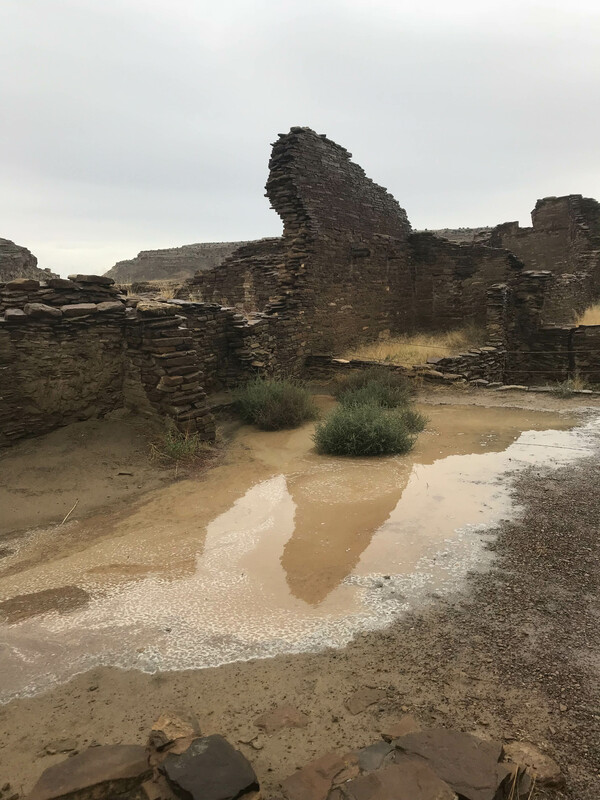 We still enjoyed the ruins and especially loved the interesting patterns left by puddles. 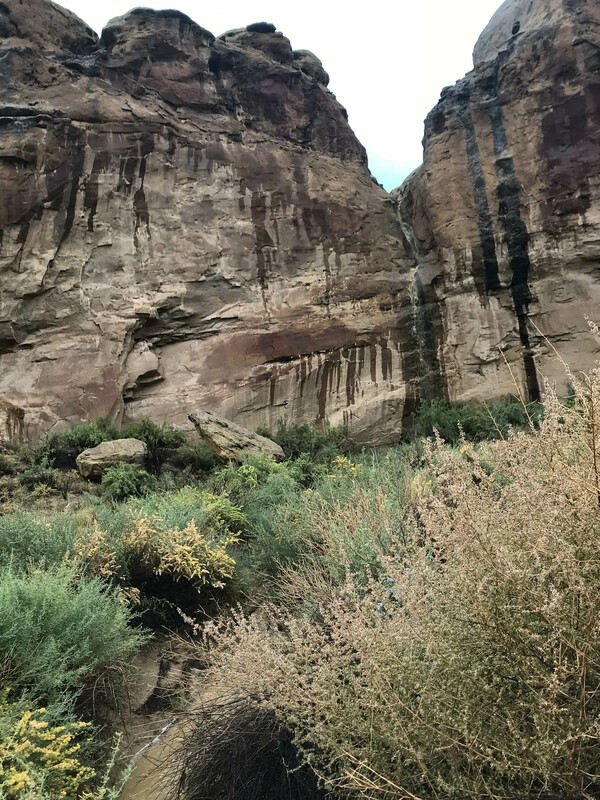 A pour-off waterfall on the rocks behind the ruins was a special treat! 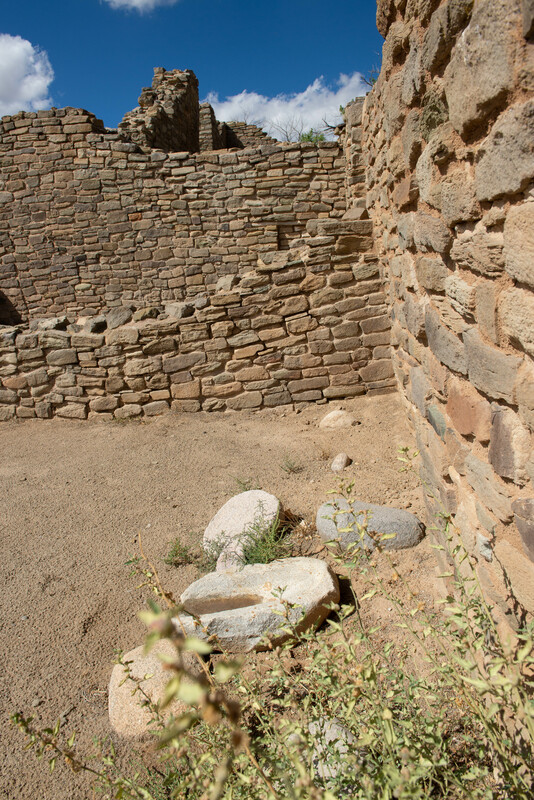 The ruins held wonderful energy that day and I would definitely recommend visiting. 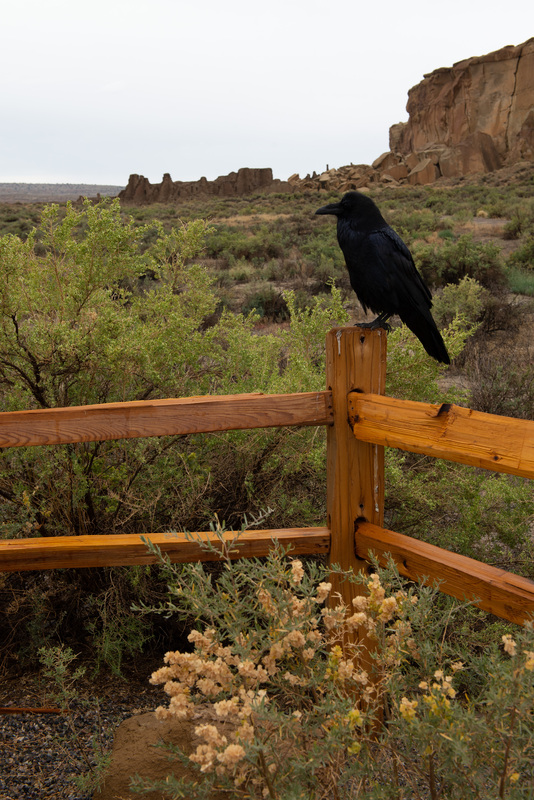 The ravens at the trailheads told us all about the specifics! 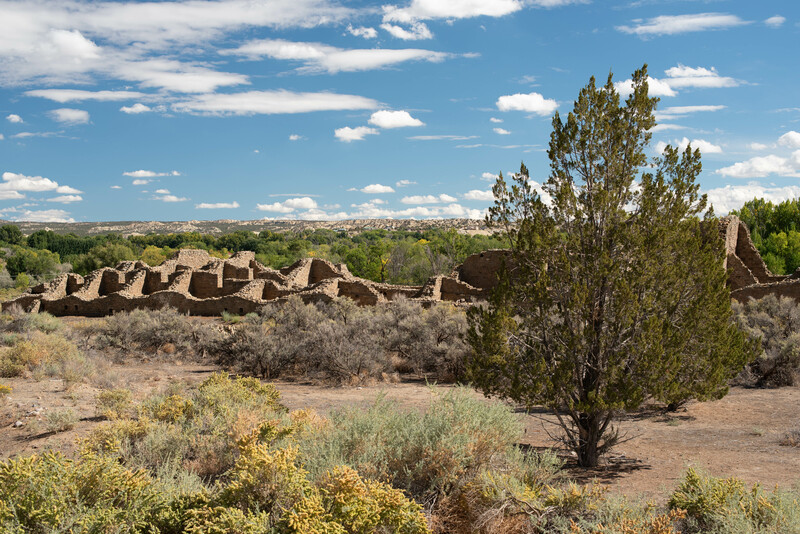 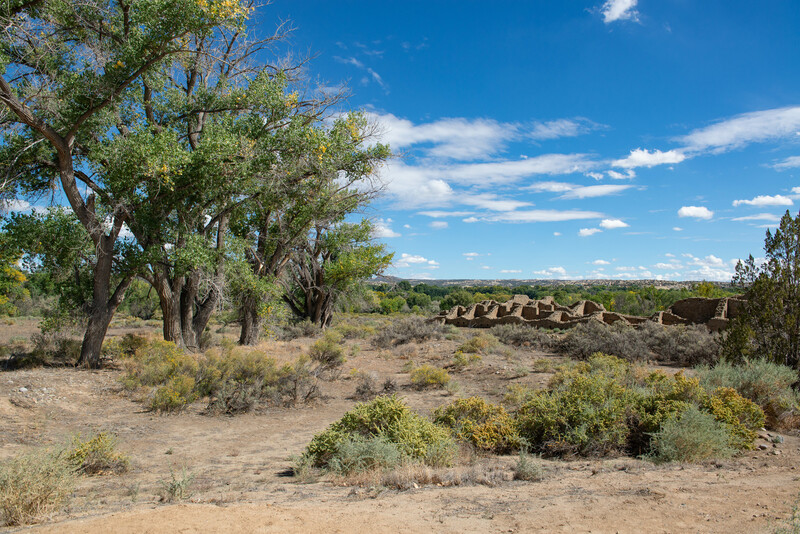 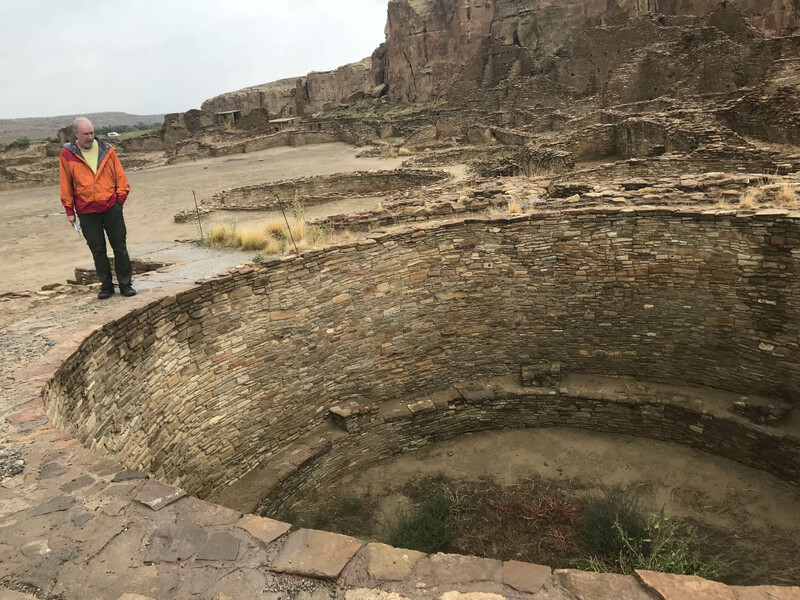 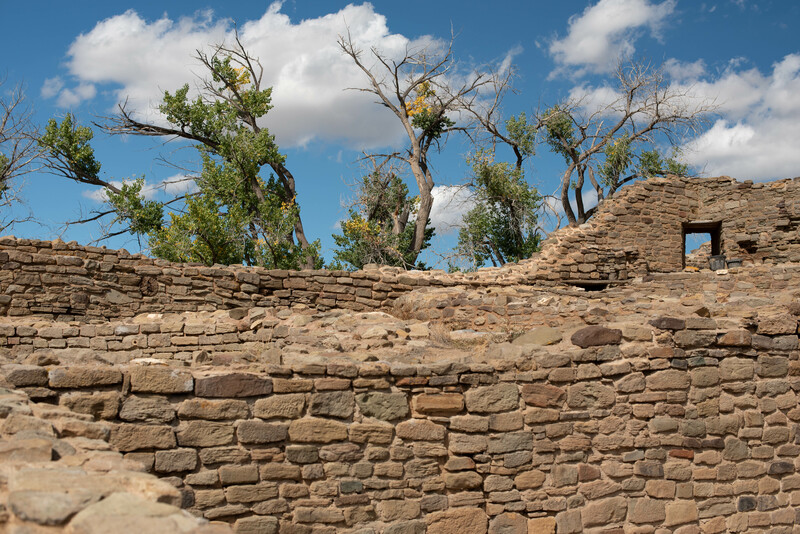 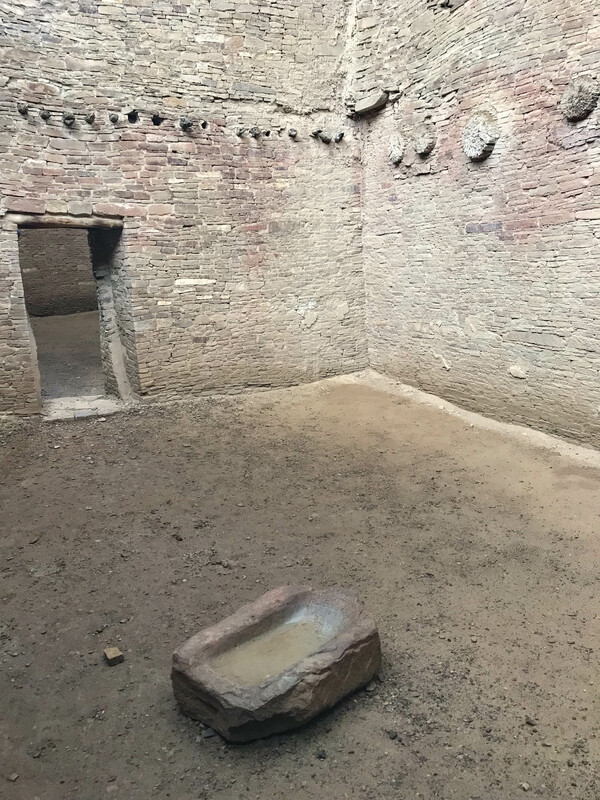 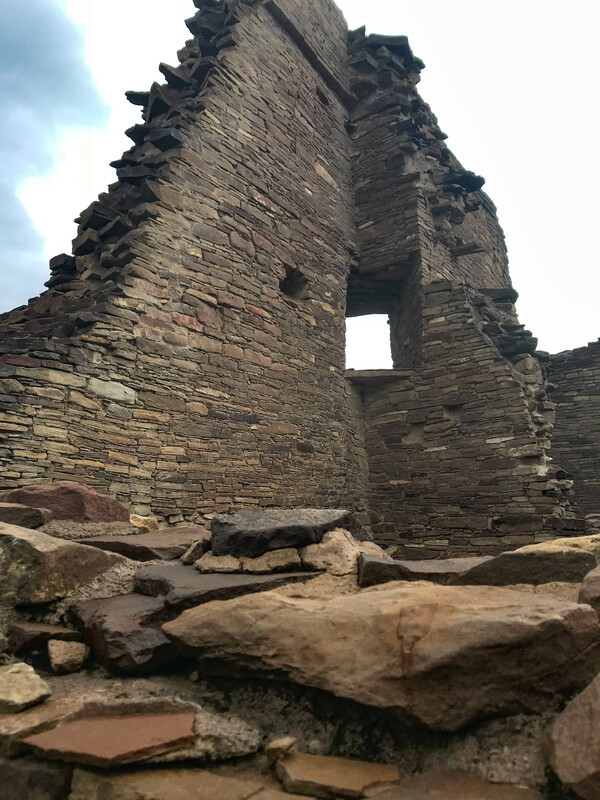 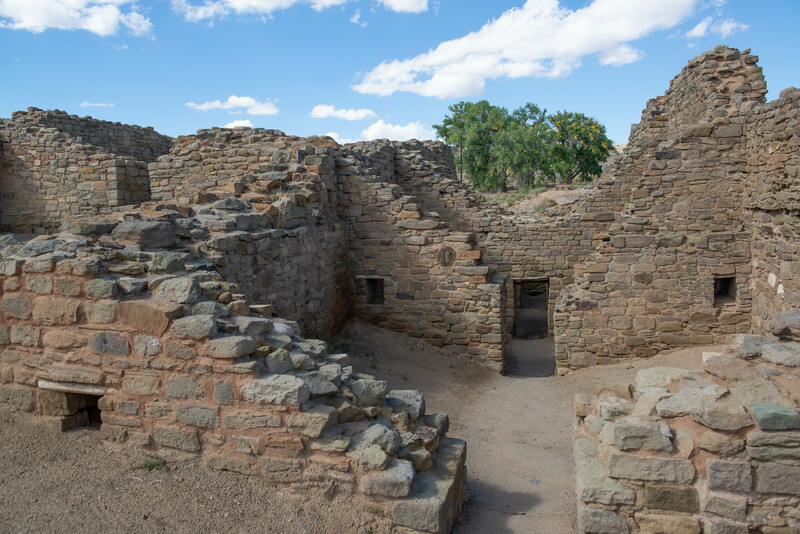 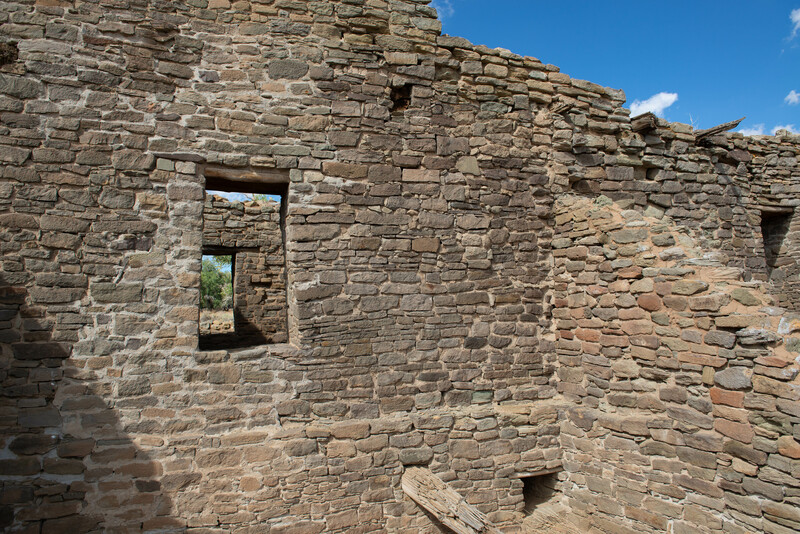 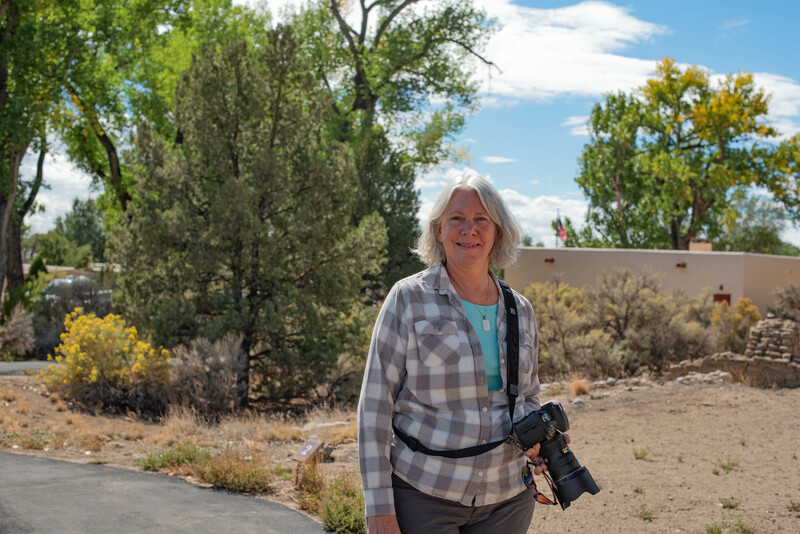 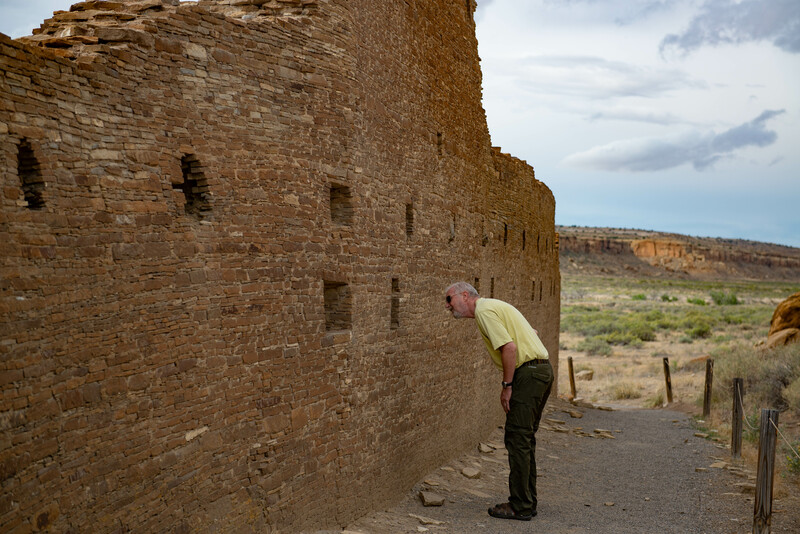 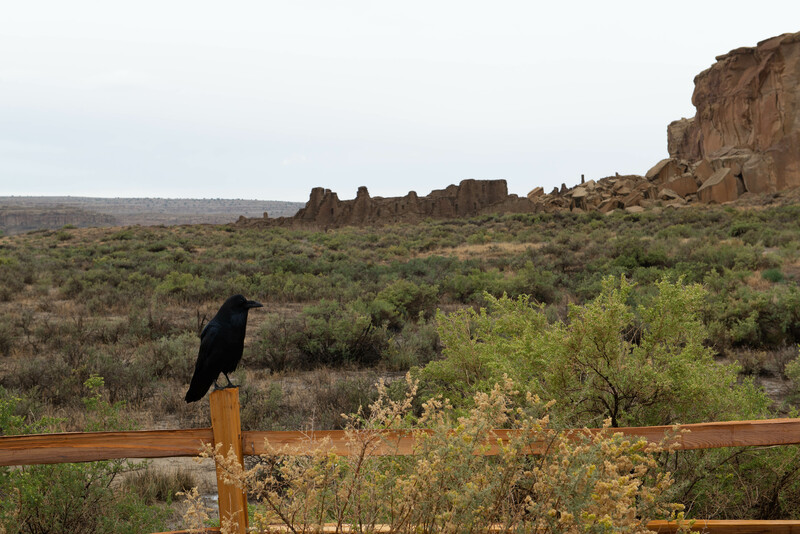 Right next to our site at the Ruins Road RV Park, the Aztec Ruins National Monument highlights beautifully preserved Pueblo buildings dating back 900 years. 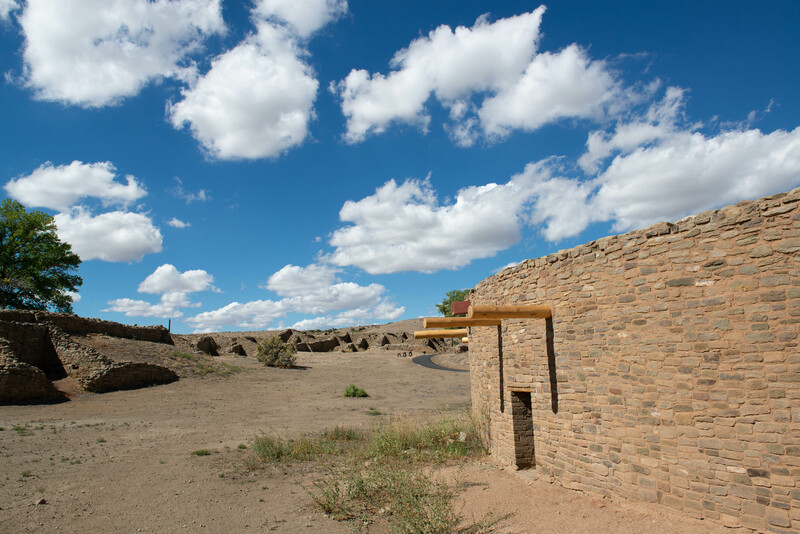 Unique T shaped doorways, intact rooms with original timbers and a beautifully restored great kiva give a good perspective of the way Pueblo people lived. 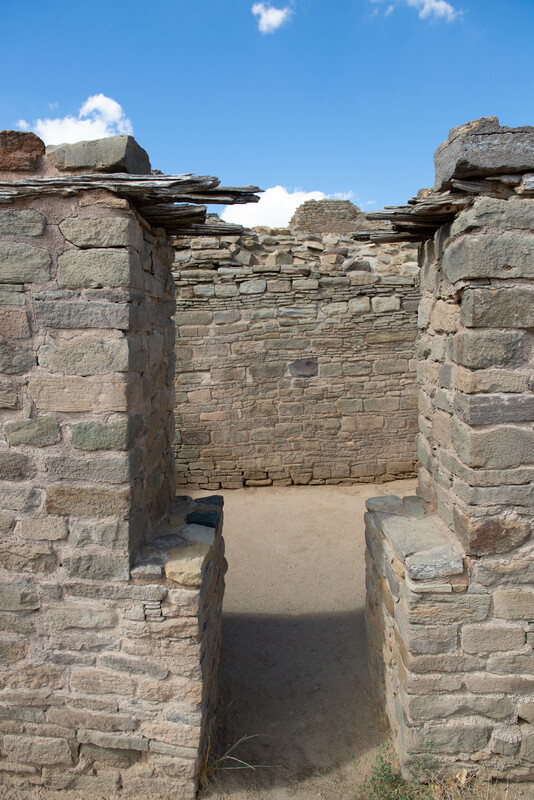 The kiva is still used for ceremonial purposes today. 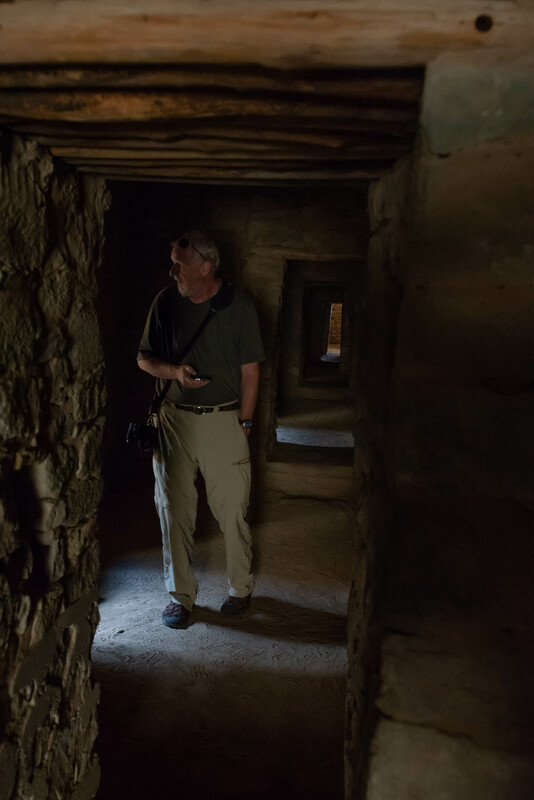 The Aztec Ruins are right in town and easy to get to which means there are a lot more visitors than the more remote Chaco Culture site.